Giftt Hub Founded in 2012 under the name of "Step Upp", the firm has evolved as a bold brand that is fueled by its Happy Clients. Today the re- branded firm goes by the name of "Giftt Hub". Giftt Hub is driven by innovative gifting solutions peculiar to client brief with a strong vendor base that spans across India. It is our passion to go beyond the cliché and provide our clients with creative products. Our esteemed client list includes well known brands like Convergys, United Airlines, Yes bank, Cambridge University and British Council to name a few. It's not just a regular pen stand but a product that will add value to your desk. Penstand with a 3 port multi connector. 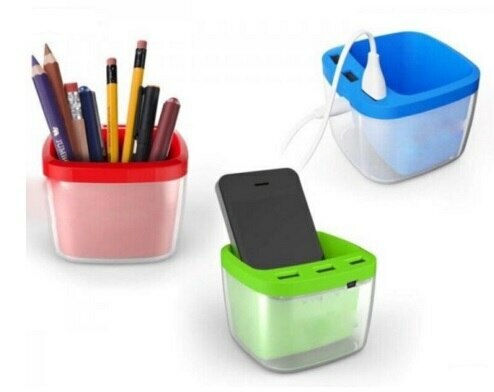 It can store your stationery and since it has 3 USB ports which when plugged into your computer gives output to 3 other USB Hubs. Use the ebucket to charge your mobile phone or plug in USB drives for your convenience..The stand can be used to place a smartphone, pens, etc. It has ample space for branding the concealed LED lights inside the stand enhamces the branding area.